What we’re doing: Providing high quality, area-level, health-related data that is available to everyone. We provide relevant and timely information at no cost online and in a user-friendly format so that communities in Ontario can identify issues related to health equity and respond. Build community capacity to use health information. Build a deeper understanding of Ontario neighbourhoods in order to appreciate the health needs of communities. Foster academic-hospital-community collaborations to improve population health. Demonstrate health inequities in order to address them. How we’re doing it: Through a data partnership, we utilize health data housed at ICES for the majority of our health indicator topics. Other data partners include Toronto Public Health, community health providers and researchers. We generate this data for various levels of geography such as neighbourhoods, and provide it to our users in different formats. Our data is downloadable and available through our website: www.ontariohealthprofiles.ca. Members of our team also offer email consultations. In 2016, we expanded from our start in Toronto to offer high quality data for communities in many areas of the province including neighbourhood-level data for both Toronto and the Central LHIN. 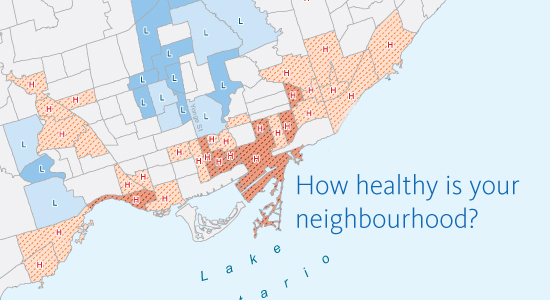 Case study: Recently, the Toronto Central Local Health Integration Network used our data to inform planning at the neighbourhood-level to identify hot-spots requiring additional primary care resources. More information: Please explore our website, and contact us with any questions. Contact Anne-Marie Tynan at tynanma@smh.ca, or Dr. Rick Glazier at glazierr@smh.ca. We look forward to hearing from you!